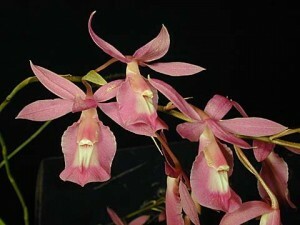 Barkeria orchids are close relatives to Cattleya and Epidendrum (and once these orchids were classified within Epidendrum genus), but they have a unique morphology, ecology, which are the reasons that they are classified within the other distinct genus. Their uniqueness lies within their morphology – they are sympodial but do not possess pseudobulbs. Unlike Cattleya, they have stems, which are long and can-like. Leaves are thin, nice but do not have longevity – in fact, they are deciduous, unlike most other Laeliinae orchids, which have perennial leaves. 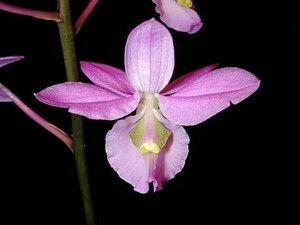 Barkeria orchids grow in Central American warm forests with distinct and long dry periods. So they are adapted to this – and adaptation is winter dormancy, Barkeria just drop their leaves and stay nearly lifeless, only in spring, when the plant gives new growth, you finally understand that it was only dormancy and the plant is alive. And another distinct feature is thick roots. Barkeria orchids are small to medium sized sympodial epiphytes and lithophytes with distinct dormancy. The most common in cultivation species is Barkeria lindleyana, or Lindley Barkeria. It has flowers, born in racemose inflorescences with five to twenty flowers. Flowers are relatively large, up to 3 inches wide, odorless, pink to light purple, there are also very beautiful alba clones with white flowers. Barkeria lindleyana blooms in the fall on mature stems, just before leaves drop. Barkeria uniflora (synonym Barkeria elegans) is a type species. It has more tender habit, flowers are smaller, light pink with purple markings on a lip. It blooms in the fall and winter. Barkeria melanocaulon is a lovely miniature orchid with lavender 2 inch wide flowers, blooming in the summer. Barkeria spectabilis has very lovely 3 inch wide short lived pink flowers, lips are white with pink spots and markings. Barkeria orchid care is not very difficult, but quite specific. It can grow in pots, hanging baskets or mounted on slabs, but the latter two are much more preferable, given the fact that Barkeria orchids have long, thick, epiphytic roots which require a lot of air. Temperatures should be cool to warm, with intermediate as optimal temperature. Light levels should be bright, something like as for Oncidiums and bifoliate Cattleyas. Waterings should be ample in the summer, when the plant is actively growing, with lots of applied fertilizers. In winter it has strict dormancy. When leaves are dropped, the plant should be given bright light and no water at all, until the new growth is seen in spring. It can shiver and look completely lifeless, but it is ok and the part of its adaptation to long dry periods at its native habitat.